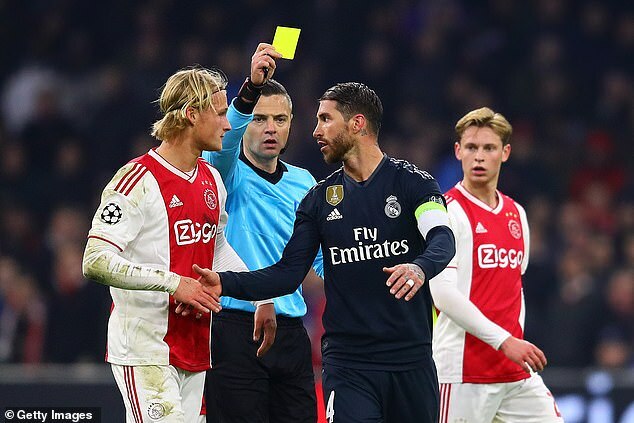 Real Madrid are pessimistic about Sergio Ramos’ chances of escaping a two-match ban for his forced booking on Wednesday night against Ajax. The precedent has already been set his season with Porto’s Jesus Corona given an extra game for forcing a yellow card in his team’s penultimate group game. Ramos’s ‘on-tape’ confession will make it very hard for the club to defend their captain if UEFA’s control ethics and disciplinary body decide to take the same line with the Spain defender. Something always seems to happen to Ramos when he goes to Amsterdam and he usually ends up regretting it. Wednesday’s forced yellow card was almost a re-run of a forced sending off in 2010 that brought a UEFA fine. Nine years ago it was the ridiculous theatre that was Real Madrid’s undoing. They were beating Ajax in their penultimate group game and Jose Mourinho wanted to do some disciplinary housekeeping getting suspensions out of the way in the dead-rubber final group game. First he spoke to Jerzy Dudek on the Madrid bench. The reserve keeper then shuttled around to Iker Casillas’s goal and passed him a note. The farce continued when Casillas then whispered into Ramos’s ear. Mourinho was banned for two games by UEFA although he only served one, and he was fined 40,000 euros (£33,473). 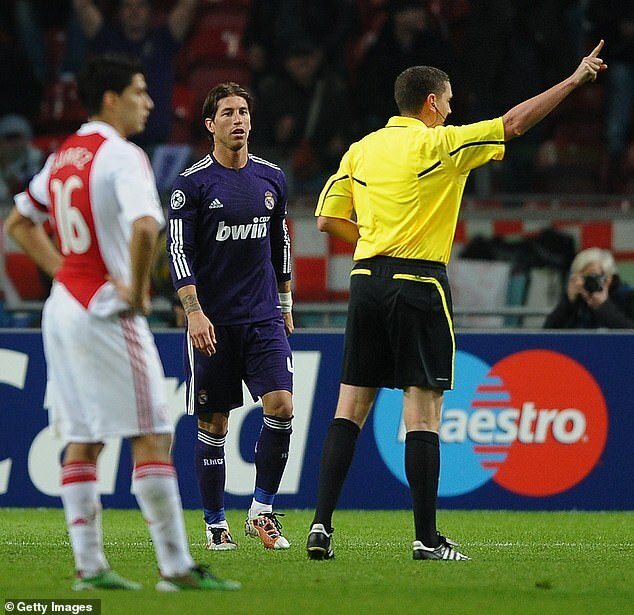 Ramos, Xabi Alonso, Casillas and Dudek were all also fined although there was not an extra game ban for Alonso or Ramos. This time he is unlikely to be so fortunate. 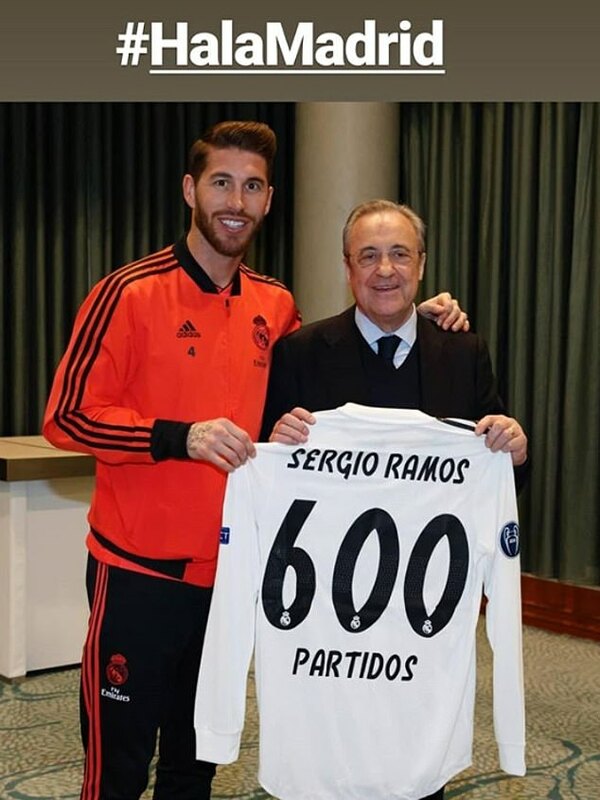 If it was peak Sergio when he clocked that Madrid were taking home a 2-1 away win and kicked Kasper Dolberg to earn the booking, then it was peak, peak Ramos to admit he’d done it in a pitch-side television interview making UEFA’s job easier. It was experienced television reporter Ricardo Sierra doing the interviewing in the media area of the Johan Cruyff Arena. He’s hugely respected for always asking the right questions and yet liked by the players for the way he does his job. Perhaps it was that friendliness that meant Ramos dropped his guard when asked about the 88th minute foul and just how deliberate it might have been. 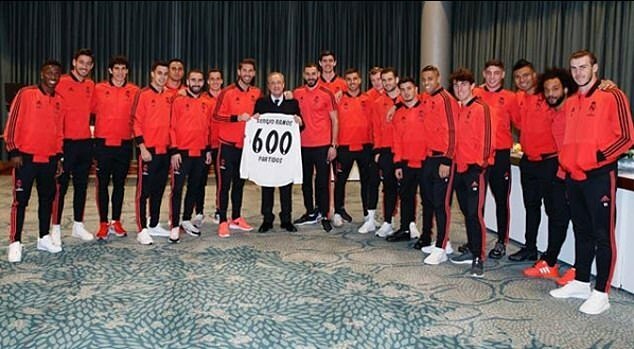 Or perhaps it really was just him being overly pleased with himself having played brilliantly in his 600th game for Real Madrid and making sure his suspension falls on what ought to be a straightforward second leg. Either way the cat was let out of the bag and no amount of backpedalling on social media is likely to reverse that. He was right on all counts. 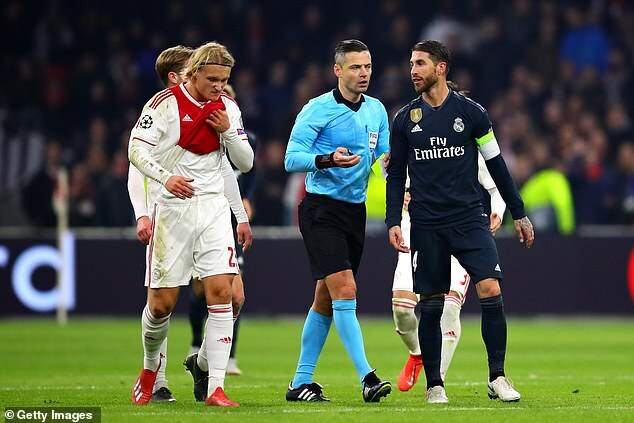 Ramos’ performance was one of his best in recent seasons in the Champions League against an Ajax side who belied their shocking domestic form to outplay Real Madrid for large parts. Even the late foul was not a mistake. It makes sense for defenders – when it is so easy for them to accumulate the cards and miss big matches – to try to make sure they miss games of less importance. 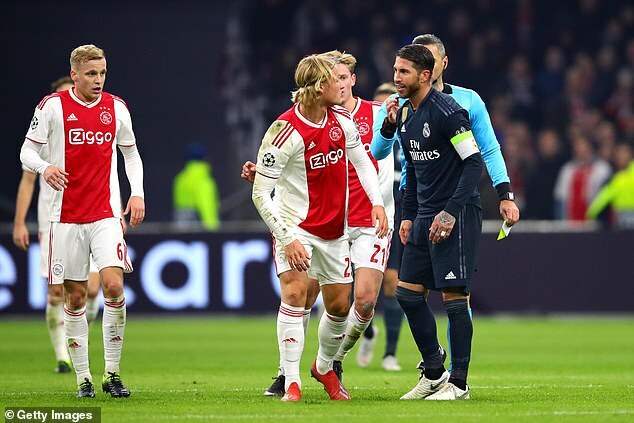 UEFA would not have been able to prove he had done it deliberately – even with the handshake he gave Dolberg after the Dane had got to his feet. But they will take action now they have Ramos on tape coughing the crime. Not since he said he was pleased to have ‘picked up the three points’ after a Champions League knockout first-leg game has he let himself down so much in front of the post-match microphone. That just brought derision, this will be more costly. Madrid will miss Ramos in the quarter-finals if he is banned. He is, more than ever since the departure of Cristiano Ronaldo, their leader. His will to win and his willingness to do anything to end up on the winning side has forced him to push back the boundaries as far as possible. In last season’s Champions League final he incensed Liverpool fans by injuring Mohamed Salah after wresting him to the ground with an arm lock that injured his shoulder. He also elbowed goalkeeper Loris Karius moments before his first crucial error in the game. He also feigned injury as the clock ran down on Real Madrid’s fourth European Cup win in five years. Ramos has done more than any other player to secure that incredible run, scoring the stoppage time header that pegged Atletico Madrid back to 1-1 in the 2014 final and scoring in open play and in the penalty shoot-out when they beat them again two years later. Real Madrid were beating Ajax and Jose Mourinho wanted to get suspensions out the way ahead of a dead-rubber final group game. After conferring with an assistant, he spoke to Jerzy Dudek before the keeper relayed a message to Iker Casillas’s goal with a note. 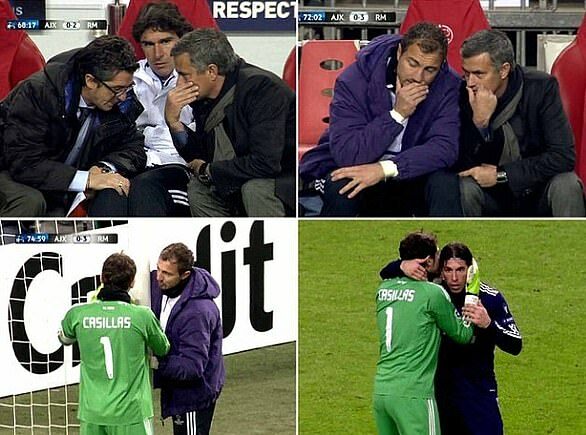 The farce continued when Casillas then whispered into Ramos’s ear. His early season form was poor so it was suggested his biggest fear might be that Mourinho’s return would mark the end for him. He was suffering largely because he had an underperforming Marcelo to his left but since 22-year-old Sergio Reguilon has come in at left back Madrid haver looked more solid, with Ramos back in complete control. He was in control last night… until his first post-match interview.